My husband is an avid Fender guy and plays around with building his own guitars. I would love to surprise him by building a guitar amp for him out of something cool, like a beer can, thermos, or lunch box. I've seen some ideas online, and spent an hour at Radio Shack trying to piece some parts together today based on an idea I saw on Instructables.com, but I don't think I've got a great plan. I don't know how to read schematics, but I am willing to do that research to figure it out if necessary. I would love a relatively simple but fully functional and very cool plan for creating an amp for him. 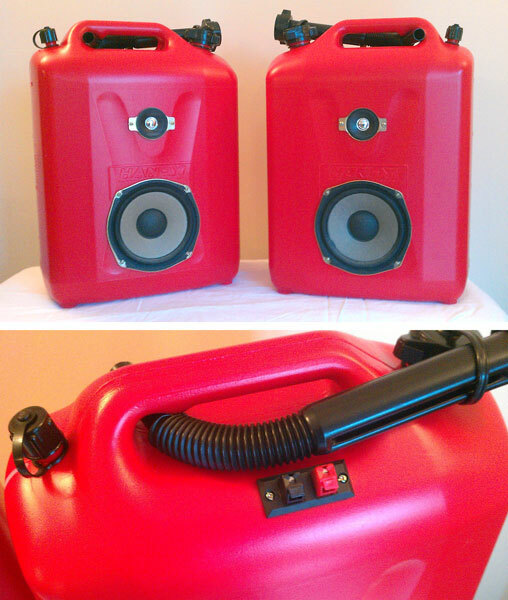 I'm thinking something like the Smokey Amp, but in another casing. Hope you can help!! 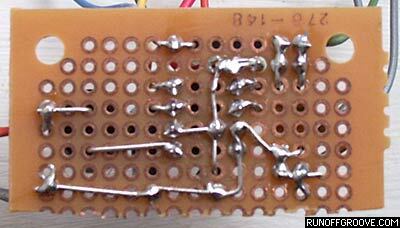 Do you know how to solder? That you will need to know. Unless you built it on a breadboard...that could be solderless for the most part. This can be run from either a 12 volt battery pack and/or a 9-12 volt DC "wall wart"/plug-pack mains supply. Joe's right, small amps like this have been built into all manner of things that happened to be to hand. I go wandering around supermarkets, $2 shops, hardware stores, and thrift/op-shops looking at things like sundry containers and even baking dishes thinking "amp chassis" and it's surprising what turns up when you look at stuff that way. ... with a hole cut in the side to accommodate a 6 or 8-inch speaker (bigger the better) with the circuit board stuck down inside using a few dabs of silicone sealant. Soldering is not a hard skill to acquire. You need rosin-cored electrical solder, a soldering iron of about 30 watts, and a damp cloth pad to wipe the tip before making each joint. - run a little fresh solder onto the joint. Don't carry solder to the joint on the iron tip (all the flux quickly burns away). Heat up the joint and let it melt the solder, not the iron tip. A good joint should still show the general outlines of the wires, too much solder and it gets blobby (but you can melt off excess with the iron), not enough heat and the solder goes pasty rather than fluid. You are sure to find some soldering instructional videos on YouTube. Will be interested to follow how you get on. Thank you both so much for the replies!! I plan to make it a project over the long weekend and will post my results (and probably questions!). Progress; thinking, drawings, and pix. Sound samples. The plans I am using call for a LM386N-3 Audio Amplifier Chip. I bought one at RadioShack that does not specify if it is -3, -4, -1, etc. Can I tell from the description on the back? Does it matter? The plans I found also call for mini blade auto fuses, 3 amps and 5 amps. It says they are optional. It also says, "Too much current will not only burn up your amplifier, but it can kill you." Not wanting to get killed by making this gift, do you think these fuses are a necessity? Is there a real danger of me getting hurt by this 9 volt battery?? Guitar Amplifiers," by Mike Melvin and Tim Swike. It is helpful because it explains the technology/science and has very detailed pics. I looked at the links you guys shared with me, but I am too new at this to understand all of it without detailed explanation (especially the schematics). Then I stumbled upon the book on Amazon, and for $11, I figured it was worth the investment. I am heading out to RadioShack soon to exchange some of the things I bought when I thought I would follow a different plan. I am hoping to find the things I am missing there! Once I hear back from you guys, I will start braving the process of actually starting this project. Breadboard can be used for prototyping or building. As this is a one off project you can use the breadboard as the finished product. If you decide you want to go into production, it would be easier to use printed circuit boards. The 386 suffix denotes how much voltage the IC can withstand, any version is good for at least 9V, so you don't need to worry about it. Fuses are optional. You can't hurt yourself with a 9V battery (unless you really wanted to, and connect wires to it that you pierce your skin with). I'm personally not mad on breadboards, but they are no way permanent, so what you need are "prototyping printed circuit boards". These are small general purpose PCB which you solder to and are a lot more solid (+/- your soldering) when you are finished. ...and this is exactly what I think you should be building. The difference between the IC types are that as the numbers go up they are able to work at higher powers and higher supply voltages. I don't think that's going to matter on a 9V battery supply coz the limits are 15V and 18V. If you use a good quality round hole 8-pin socket you can easily change the IC if needs be. "Too much current will not only burn up your amplifier, but it can kill you." Which realistically has somewhere about the same odds as alien abduction ; forget the fuse. ...for a couple of reasons; not least there are very good diagrammes and pix of the actual construction, and if you have never built anything before, this is the way to go. The second reason is that I think this amp will have much better performance than the other suggested design. Sorry, I seem to have messed up with my interpretation of "breadboard". I was thinking you meant perfboard (vero or strip board) like the picture Roly posted. The radio shack breadboard you have is what I call "protoboard" and is not suitable for a permanent installation (and way more expensive). Obligatory caution: building electronic stuff is highly addictive. This is built entirely using the leads of the components to make the connections, no added wires except for external connections. Just stuff the component through and bend the leads to where they need to go, solder, trim (good fine side cutters needed! ), next component. I have a few old suture clamps/hemostats that I use for lead forming, but fine needle-nose pliers will do. Only about 20-25 solder joints in all. Start by placing the IC socket (in the right place, the right way around) and tack solder at two diagonal corner pins. Build relative to that. Watch the polarity of the FET, the IC, and the two electrolytic caps (and the battery connection!). Thanks for the video clip...I'll probably need her inspiration as everything involved in this project is new to me, but at this point, I can't even get started enough to fail. Though I suppose that is a failure in itself. LOL. I will take your advice and try the Ruby, but I think that one must have some knowledge of how to read those schematics in order to figure out what components to purchase, b/c I didn't see a list and I have very little idea of what I need. I recognize some of the parts, but not all. I appreciate your help, and l look forward to sharing my eventual success with you guys! Not much of a quitter, so I know I'll figure this out at some point. THANK YOU! The first link seems to be just what I need!! Here´s a simple version, with reasonably easy to follow instructions, a drawing (besides the schematics) of how parts should be mounted and connected to each other and an important "extra" : a ready to solder PCB which I suggest you buy. It still is your decision where to mount it, from (emptied ) beer can, to cigar box to Tupperware to ild VCR tape box. The first one is the most difficult, I remember mine, full of doubts, reading schematics 1000 times to make certain, solder either not sticking or melting all plastic parts within a mile, ugh !!!! Just got back from RadioShack...they had *most* of the things on the list, but not all. I am going to post pics of what I bought, in the hopes you can confirm I bought the right things! I bought a big bag (500!) of Carbon-Film Resistors, all 1/4 Watt, because they didn't have the ones I needed in individual packages. This includes the 10ohm, 3.9K, 1.5M, and 1K called for in the plans. I found a 10K Linear Pot--but it was called a mini-volume control. Is that right?? Could not find a 1K Pot and the 1K Trimmer was not a switch at all--it was a little blue thing that seemed very wrong based on the schematics, so I didn't buy it. Could not find the transistor. I already had the LN386. Purchased the .047uF 50WVDC, 100uF 35WVDC, 220uF 35WVDC, and just realized I didn't buy the .1uF. How do I tell the voltage rating? Is that indicated by the "35WVDC"? The plans say minimum of 16 Volts. Bought the input and output jacks, a 5mm red LED light, batteries, snap connectors, 22 Gauge Stranded wire (they didn't have 24...is this ok?? ), desoldering braid, 60/40 rosin-core solder, and a small general purpose printed circuit board (the thing I am most uncertain is right). So far, I have spent close to $80 on this, I think! Is that right? I realize I will be able to use many of the elements I purchased again in the future, so I guess it's not so bad. LOL. SO, to recap: I am still missing the 10K Pot, the MPF102 Transistor, and the .1uF Capacitor. Hopefully I can get started with what I have?? Getting excited to get this going!